First of all, it's important to understand how the word entered English. Despite some discussion to the contrary, it's clear that the word entered German from Yiddish, and not the other way around. It became popularized in German via the 1814 story "Peter Schlemihls wundersame Geschichte" ("Peter Schlemihl's Remarkable Story") by Adelbert von Chamisso. However, English apparently adopted the word shlemiel directly from Yiddish, not via German. (It is still used in German, and even the name of the Sesame Street muppet Lefty is "Schlemihl" in the German version). Now to the Yiddish origins. I'll admit from the outset that I don't know the "true" origin, and I doubt any of us ever will. But I will review the various theories and tell you which seem more or less likely to me. 1) Even-Shoshan suggests that it is a corruption of the similar Yiddish word shlimazel (or schlimazel). Schlemazel is a combination of the German schlim (= "bad, crooked", related to the English "slim" ) and the Hebrew mazal מזל (= "luck"). 2) Klein (in his entry for the Hebrew equivalent shelumiel שלומיאל) writes that it is "probably a transposition of shelo mo'il שלא מועיל (= useless)." we would expect shelo mo'il to give something like *shloyml or *shlemoyl (the asterisk is used to indicate a form that does not exist). Since that is NOT what we find in Yiddish, the etymology in question cannot be accepted. a) One theory is based on the Talmud's claim (Sanhedrin 82b) that Shelumiel was one of the five names of Zimri, the prince of Shimon killed by Pinchas for sinning with a Midianite princess. Ignoring the fact that Shelumiel and Zimri lived a generation apart, Zimri doesn't seem "unfortunate" but "bad"! Why should the nickname come from him? Rabbi Norman Lamm wrote an essay in 1974, called "The First Schelmihl". He claims that the shlemiel is not "hapless, luckless, a constant victim of conspiring circumstances", but rather is "sinister", "egotistical", and "will let no one and nothing stand in his way". While Lamm's homelitcal message is very powerful, it's hard for me to believe that the average person would make that jump, and understand that a real shlemiel is so evil. It just doesn't fit with the the way the word is used. On the other hand, there are those that say that Zimri was unlucky, because while many were involved with the Midianites, he was the only one to get caught. But as Lamm pointed out, Zimri was clearly of a higher standing than the average person, and as the Talmud itself mentions, Zimri's act was as much of a rebellion against Moses as it was submission to passion. Another question can be asked: if Zimri, for whatever reason, was the archetypal shlemiel, then why aren't we calling people zimris instead? One suggestion is that this was a private joke of the rabbis, to avoid recalling the improper nature of Zimri's act. Here too, I have difficulty accepting the idea that this kind of "conspiracy" would stick well enough to enter the popular jargon. In any case, the Talmud always refers to the culprit as Zimri, not Shelumiel, even such folksy sayings as "Their deeds are like those of Zimri, yet they ask for reward like Pinchas", so it doesn't seem likely that Zimri is our shlemiel. The exception is the Sabbath during Hanukkah, when the Torah portion is that of the regular weekly cycle and the added maftir reading from a second scroll is the Hanukkah reading beginning with the daily chieftain. Only one day of Hanukkah’s eight never falls on a Sabbath: the fifth day. And which chieftain therefore never stars on the Sabbath, when the synagogue is far better attended than on a midwinter weekday morning? Why, Shelumiel ben Tsurishaddai, of course. Who else? While this does seem somewhat complicated, I can see how an average person might have noticed the fifth night's bad luck year after year (for a more positive take, see this Treppenwitz post.) However, Werner Weinberg (who taught us how to spell Chanukah here) writes in his Die Reste des Jüdischdeutschen that the first mention of this theory is in Halozebichel (Joke Book) of Rabbi Meir Ohnesorg, Prague 1864, p. 62. I couldn't find that book anywhere, but it seems possible that the whole etymology was just a joke. Whom the spear of Phinehas slew. This is clearly not what the Torah is describing, nor does it appear in any midrash. But it seems to have a lot of influence, and perhaps the very association of Shelumiel and shlemiel began with Heine (or Hitzig). וכן העיד שמה"ר שלומיל מעיר ענש הלך פעם אחת ללמוד למרחקים, ויהי לתקופת י"א חדשים ליציאתו ילדה אשתו והכל מעידין מרוב חסידותה ברור שלא זינתה תחתיו. "And so testified Rabbi Shlomil of the city of Enns, that he once traveled far to study, and eleven months after he left his wife gave birth. But all know, that due to her righteousness, she clearly did not cheat on him [but rather had an unusually long pregnancy as mentioned in the Talmud, Yevamot 80b]"
However, I'm partial to the explanation that the first Jewish coins were produced during Hasmonean times, and the custom to give out money came to commemorate that. Is it historically true - I don't really know. 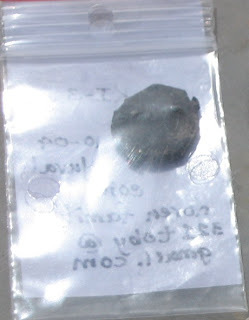 But since my kids happened to find this Hasmonean coin at an archaeological dig in Jerusalem earlier this year, I certainly have an emotional connection! What ever the reason - and please read this very funny article by Amy Klein about the development of giving both monetary and chocolate gelt - the custom has certainly become associated with Chanukah. Gold has an entirely different etymology - it comes from the Indo-European root *ghel, meaning "yellow". c.1230, yilde (spelling later infl. by O.N. gildi), a semantic fusion of O.E. gegyld "guild" and gild, gyld "payment, tribute, compensation," from P.Gmc. *gelth- "pay" (cf. O.Fris. geld "money," O.S. geld "payment, sacrifice, reward," O.H.G. gelt "payment, tribute"). The connecting sense is of a tribute or payment to join a protective or trade society. O.E. gylt "crime, sin, fault, fine," of unknown origin, though some suspect a connection to O.E. gieldan "to pay for, debt," but O.E.D. editors find this "inadmissible phonologically. We previously looked at glatt, which went from describing a particular stringency regarding the lungs of cows, to describing extra kosher food in general. A similar example can be found in the word terefah טרפה, which in the Torah (as in Shmot 22:30) refers to an animal whose "flesh (was) torn by beasts in the field." The root טרף means "torn to pieces". In Talmudic Hebrew, the meaning of terefah was extended to mean "a clean animal inflicted with an organic defect, a mortal injury, or a fatal disease" (Sarna on Shmot 22:30, see also Kehati's introduction to Hullin 3:1). And later, the term expanded to include all non-kosher food, and the adjective taref טרף was adopted (Klein points out that this is a "back formation from terefah, which was regarded as a feminine adjective.) From taref, we got the Yiddish treif, which can mean anything not "kosher", even non-food items. But as we mentioned above, the original meaning of the verb as "to tear away." In Biblical Hebrew teref could also mean food in general, such as in the phrases טֶרֶף, נָתַן לִירֵאָיו - "He gives food to those that fear Him" (Tehillim 111:5) and וַתִּתֵּן טֶרֶף לְבֵיתָהּ - "She provides food for her household" (Mishlei 31:15). Certainly neither case is talking about treyf food! A related sense of טרף is "to mix, confuse". The Talmudic term for a beaten egg is ביצה טרופה - beitza terufa. A person who is mixed up, disturbed, confused is מטורף metoraf - which in Modern Hebrew means "insane". And just as in English, where the word "mad" means insane, but "like mad" means "with excitement or enthusiasm", so too does metoraf mean in Israeli slang not only "crazy", but "excited, exceptional, unbelievable" and בטירוף b'teruf means "with excitement." This got me thinking - are there any Hebrew words cognate to this Arabic root? It looks like there's a good chance. In Bereishit 8:11, we find the following phrase: וְהִנֵּה עֲלֵה-זַיִת טָרָף בְּפִיהָ. "And there, in its bill, was a taraf olive leaf." Some commentaries, such as Rashi, explain taraf as a verb, meaning "plucked", relating it to our earlier understanding of taraf as "torn". But according to Cassuto, this is a difficult explanation, and we should rather view taraf as an adjective meaning "fresh", which is cognate to our Arabic root meaning "new". Cassuto claims that this is the view of most commentaries, and I have seen it in Ben-Yehuda, Kaddari and Daat Mikra. So we've gone from an animal with a fatal disease, to a fresh, new leaf. Pretty metoraf, no? Today the word mehadrin מהדרין is generally associated with “super” kosher food (or even bus lines…). But the word actually first appears in the laws of Chanukah, in Masechet Shabbat 21b. There it says that if one lights a candle for each member of the household it is considered mehadrin, and if one adds (or subtracts) additional candles each night, it is considered hamehadrin min hamehadrin. There are two explanations to this term (see this article for an explanation of the significance of the two opinions). The one more popularly accepted is that of Rabbeinu Yitzchak in Tosafot, who say that the word derives from the root הדר, connected to the Biblical hadar, glory (cognate to the Akkadian adaru, and related to the Hebrew adir אדיר - "noble"). According to Rabbeinu Yitzchak, when we add the additional candles, we glorify the mitzva, as we find with other mitzvot – the concept of hidur mitzva (beautifying the mitzva). But Rashi has a different explanation. He says that mehadrin is related to the Aramaic verb הדר, meaning “to return”. This root is related, through familiar consonant changes, to the Hebrew roots חדר (to surround, enclose; not actually related to חדר cheder - "room") and חזר (to go around, return, court). So Rashi explains that the person who is mehadrin, is "going around", pursuing the mitzvot. (See Brachot 53b for the parallel Hebrew expression - שמחזרים על המצוות - which is actually followed by an Aramaic translation: מהרדנא). Another word with a similar debate as to its origin and meaning is hadran הדרן – from the passage read at the completion of a tractate of the Talmud: הדרן עלך .. והדרך עלן hadran alach ... v'hadrach alan. (Eventually the passage itself became known as the "hadran", which led to the modern Hebrew meaning “encore”). Here, the common explanation is that it means “return”, and therefore the phrase means, “we will return to you, and you will return to us” (as mentioned by the Sefer HaEshkol). However, a number of researchers, such as Margolies (Olelot and Nitzotzei Or), Lieberman (Alei Ayin) and Sperber (Minhagei Yisrael vol 1; see an English summary in chapters 19 and 20 here) claim that hadran derives from hadar - “glory”, and so the phrase means, “our glory to you, and your glory to us.” This is both based on explicit mentions by earlier rabbis (such as the brother of the Maharal, Rav Chaim) as well as similar Talmudic passages: in Sukkah 45a it says that at the end of the Hoshanot on Sukkot, they would say to the altar: יופי לך המזבח - "beauty is yours, altar" and in Rosh Hashana 31a, it says that at the end of the Musaf sacrifices they would say הזיו לך - "the splendor is yours" (this phrase is actually included in the "hadran" of the Akedat Yitzhak). A similar phrase is also found in the Shir HaKavod ("Anim Zemirot") - פארו עלי ופארי עליו - "His glory is on me, and my glory is on him". In the end, Sperber concludes that the original meaning may have been "return", and the sense of "glory" was added in the times of the Geonim, so that the phrase intentionally carried both meanings. 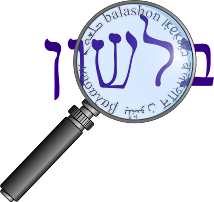 One interpretation (Rashi, Kaddari) of the the unique biblical term hadurim הדורים (Yeshayahu 45:2) is that it means "curvy paths" - and is also related to the root הדר as "return, go around". The phrase from that verse - וַהֲדוּרִים אֲיַשֵּׁר (straighten out the curvy paths, according to the explanation I quoted), is used in conversational Hebrew to mean "iron out the difficulties."